Tawakkol Abdel-Salam Karman (Arabic: توكل عبد السلام خالد كرمان‎ Tawakkul ‘Abd us-Salām Karmān; also Romanized Tawakul, Tawakel) (born 7 February 1979) is a Yemeni journalist, politician and senior member of the of Al-Islah political party (the Islamist and Yemeni offshoot of the Muslim Brotherhood), and human rights activist. She leads the group "Women Journalists Without Chains," which she co-founded in 2005. She became the international public face of the 2011 Yemeni uprising that is part of the Arab Spring uprisings. 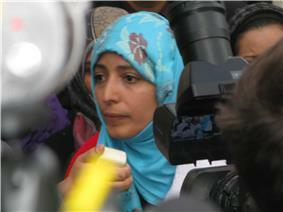 She has been called the "Iron Woman" and "Mother of the Revolution" by Yemenis. She is a co-recipient of the 2011 Nobel Peace Prize, becoming the first Yemeni, the first Arab woman, and the second Muslim woman to win a Nobel Prize and the second youngest Nobel Peace Laureate to date. ^ a b "Turkish fm receives winner of Nobel peace prize". Anadolu Agency. 2012-10-11. Retrieved 2012-10-11. ^ a b c d Al-Sakkaf, Nadia (17 June 2010). """Renowned activist and press freedom advocate Tawakul Karman to the Yemen Times: "A day will come when all human rights violators pay for what they did to Yemen. Women Journalists Without Chains. Archived from the original on 30 January 2011. Retrieved 30 January 2011. ^ a b c "Yemen laureate figure of hope and controversy". Oman Observer. Retrieved 15 November 2011. ^ a b c Al-Haj, Ahmed; Sarah El-Deeb (7 October 2011). "'"Nobel peace winner Tawakkul Karman dubbed 'the mother of Yemen's revolution. Sun Sentinel. Associated Press. Retrieved 8 October 2011. ^ a b c d e """Renowned activist and press freedom advocate Tawakul Karman to the Yemen Times:"A day will come when all human rights violators pay for what they did to Yemen.. Yemen Times. 3 November 2011. Retrieved 15 November 2011. ^ a b c "New protests erupt in Yemen". Al Jazeera English. 29 January 2011. Archived from the original on 30 January 2011. Retrieved 30 January 2011. ^ a b c d Filkins, Dexter (1 August 2011). "Yemen’s Protests and the Hope for Reform". The New Yorker. Retrieved 16 November 2011. ^ a b Karman, Tawakkol (18 June 2011). "Yemen’s Unfinished Revolution". New York Times. Retrieved 15 November 2011. ^ Shephard, Michelle (2012-11-25). "Nobel Peace Prize winner Tawakkol Karman tours Canada". Toronto Star. Retrieved 2012-12-16. ^ Townsend, Sean (2012-10-19). "Honorary degrees recognize inspirational leaders" (public relations). University of Alberta. Retrieved 2012-12-16. ^ "Turkey hopes to grant citizenship to Karman". Hurriyet Daily News. 2012-03-19. Retrieved 2012-10-11. ^ "Turkish ID more important than Nobel, Karman says". Hurriyet Daily News. 2012-10-12. Retrieved 2012-10-16. ^ a b "Female Journalists without Borders". Yobserver.com. Retrieved 16 November 2011. ^ a b "Blacklist names worst violators of press freedom". Yobserver.com. Retrieved 16 November 2011. ^ "IFJ Global – IFJ Welcomes Nobel Peace Prize Award to Yemeni Journalist". IFJ.org. 7 October 2011. Retrieved 16 November 2011. ^ "Yemen Islamists ready to share power". Oman Tribune. 14 December 2011. Retrieved 14 December 2011. ^ Nasir Arrabayee. "Can Yemen Crisis Be Internationalized More?" Yemen Observer, 8 October 2011. Retrieved 11 October 2011 from BBC Worldwide Monitoring in the Lexis-Nexis Database. ^ Karman, T. (19 February 2006). "Burning Embassys is Not the Way". Yemen Times. Retrieved 26 October 2011. ^ Tom Finn in Sana'a (26 March 2011). "Tawakul Karman, Yemeni activist, and thorn in the side of Saleh | World news". The Guardian (London). Retrieved 16 November 2011. 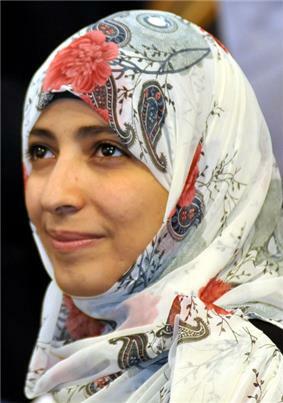 ^ "Tawakul Karman gets 2011 Nobel Peace Prize, leads Yemeni women’s Arab spring". 7 October 2011. Retrieved 8 October 2011. ^ Karman, T. (10 August 2013). "Dear U.S. administration...". Twitter. Retrieved 29 August 2013. ^ Lerner, Charlene (15 November 2011). 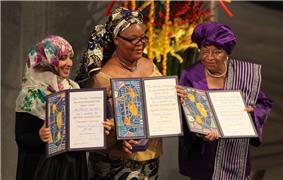 "Nobel Prize winner highlights women’s role in Arab Spring". The Michigan Daily. Retrieved 15 November 2011. ^ Finn, Tom (23 January 2011). "Yemen arrests anti-government activist". The Guardian (London). ^ "Exclusive: Nobel Laureate Tawakkul Karman on the Struggle for Women’s Rights, Democracy in Yemen". Democracy Now!. Retrieved 2013-11-22. ^ Kalpana Sharma (29 October 2011). "Columns / Kalpana Sharma : The Other Half: Women and the Arab Spring". The Hindu (Chennai, India). Retrieved 16 November 2011. ^ "Secy Clinton Praises Yemeni Nobel Winner Calls for Revolution to Bring Democracy". Washington Post. 28 October 2011. Retrieved 15 November 2011. 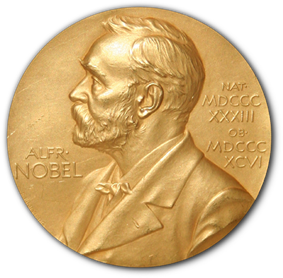 ^ "Nobel Laureates – FAQ". nobelprize.org. Retrieved 7 October 2011. ^ "The Nobel Prize Amounts". Nobelprize.org. Retrieved 16 November 2011. ^ "الموقع الرسمي لجريدة الشرق القطرية". Al-sharq.com. Retrieved 16 November 2011. ^ "The FP Top 100 Global Thinkers". Foreign Policy. December 2011. Retrieved 2 December 2011. ^ Karman, T. (9 August 2013). "Morsy Is the Arab World's Mandela". Foreign Policy. Retrieved 13 August 2013. ^ "Anti-Coup Alliance, Muslim Brotherhood: Denying Karman Egypt Entry is Police State Practice". Ikhwanweb. 4 August 2013. Retrieved 13 August 2013. ^ "The Scream: Yemeni women make their voices heard". France24. 2012-12-17. Retrieved 2012-12-18. ^ Tusing, David (2012-12-12). "Yemeni filmmaker Khadija Al Salami’s background is as compelling as her film". Gulf News. Retrieved 2012-12-18. Yemen filmmaker Khadija al-Salami documented the role that women played in the Yemen uprising in her film The Scream (2012), in which Tawakkol Karman is interviewed. Al-Salami presents three individual portraits - a journalist, an activist, and a poet - in the documentary. The title refers to women who are vocal about their position relative to men in reaction to a traditional patriarchal society. The The Scream had its debut screening at the Dubai International Film Festival in 2012. As a response to the 2012–13 Egyptian protests and the 2013 Egyptian coup d'état, Karman was supportive of protests demanding Egyptian president Mohamed Morsi's resignation on June 30, but was critical of the military's decision to oust Morsi, suspend the Constitution of Egypt and bar the Muslim Brotherhood from participating in Egyptian politics, citing that Morsi was Egypt's first democratically elected leader, the constitution was supported by 60% of people who voted in a public referendum and that the coup may cause people to lose faith in democracy, allowing extremist groups to thrive. She attempted to enter Egypt to join protests against the coup but was banned from doing so by the Egyptian military for "security reasons" and deported back to Sana'a, a decision that was criticized by the Anti-Coup, Pro-Democracy National Alliance as being reminiscent of a police state. She later denounced the military's arrests of high-ranking Muslim Brotherhood officials and the military's use of violence on protesters at sites occupied primarily by Morsi's supporters. She also made a video message in Washington, D.C. on 25 October on the occasion of the release of the 14th annual report of the Arab Spring, Yemen, and Karman. In reaction to the award Karman, while camped out in Sana'a during ongoing anti-government protests, said: "I didn’t expect it. It came as a total surprise. This is a victory for Arabs around the world and a victory for Arab women" and that the award was a "victory of our peaceful revolution. I am so happy, and I give this award to all of the youth and all of the women across the Arab world, in Egypt, in Tunisia. We cannot build our country or any country in the world without peace," adding that it was also for "Libya, Syria and Yemen and all the youth and women, this is a victory for our demand for citizenship and human rights," that "all Yemenis [are] happy over the prize. The fight for democratic Yemen will continue," that she "dedicate[s] it to all the martyrs and wounded of the Arab Spring… in Tunisia, Egypt, Yemen, Libya and Syria and to all the free people who are fighting for their rights and freedoms" and "I dedicate it to all Yemenis who preferred to make their revolution peaceful by facing the snipers with flowers. It is for the Yemeni women, for the peaceful protesters in Tunisia, Egypt, and all the Arab world." She also said she had not known about the nomination and had found out about the award via television. Karman, along with Ellen Johnson Sirleaf and Leymah Gbowee, were the co-recipients of the 2011 Nobel Peace Prize "for their non-violent struggle for the safety of women and for women’s rights to full participation in peace-building work." Of Karman, the Nobel Committee said: "In the most trying circumstances, both before and during the 'Arab spring', Tawakkul Karman has played a leading part in the struggle for women’s rights and for democracy and peace in Yemen." The Nobel Committee cited the United Nations Security Council Resolution 1325, adopted in 2000, which states that women and children suffer great harm from war and political instability and that women must have a larger influence and role in peacemaking activities; it also "[c]alls on all actors involved, when negotiating and implementing peace agreements, to adopt a gender perspective." Karman also met the United States' Secretary of State Hillary Rodham Clinton on 28 October to discuss the same United Nations Resolution, to which Clinton said "the United States supports a democratic transition in Yemen and the rights of the people of Yemen – men and women – to choose their own leaders and futures." Karman responded to the comment through the Yemini press by saying, "in Yemen, it has been nine months that people have been camped in the squares. Until now we didn't see that Obama came to value the sacrifice of the Yemeni people. Instead the American administration is giving guarantees to Saleh." On 18 June she wrote an article entitled "Yemen's Unfinished Revolution" in the New York Times in which she assailed the United States and Saudi Arabia for their support for the "corrupt" Saleh regime in Yemen because they "used their influence to ensure that members of the old regime remain in power and the status quo is maintained." She argued that American intervention in Yemen was motivated by the war on terror and was not responsive to either the human rights abuses in Yemen or the calls from Yemen’s democracy movement. She affirmed that the protesters in Yemen also wanted stability in the country and region. In an interview on Democracy Now!, Karman said, "In our weekly protests in front of the cabinet, we called on the government to allow people to have freedom of speech and for people to be able to own online newspapers. We knew and know that freedom of speech is the door to democracy and justice, and also that part of the freedom of speech is the freedom of movement... The culture of freedom and protests spread all over Yemen. Every time we stood up for our rights the government answered with violence or interfered in our rights...." She credited Tunisia for inspiring others around the Middle East for the Arab Spring protests. Speaking before an audience at the University of Michigan, Karman summed up her belief: "I am a citizen of the world. The Earth is my country, and humanity is my nation." Likewise, she says she remains independent from foreign influences: "I do have close strategic ties with American organizations involved in protecting human rights, with American ambassadors and with officials in the U.S. State Department. (I also have ties with activists in) most of the E.U. and Arab countries. But they are ties among equals; (I am not) their subordinate." She has frequently objected to U.S. drone policy in Yemen, calling the use of them "unacceptable" and has argued that using them in populated areas violates human rights and international laws. Following an increase in the number of drone strikes in August 2013, she called for an immediate halt of all strikes, proclaiming that the bombings undermine Yemen's sovereignty and contribute to increases in Al-Qaeda recruits in the country. She has also led protests against government corruption. Her stand on the ouster of Saleh became stronger after village lands of families around the city of Ibb were appropriated by a corrupt local leader. Tawakkol Karman is a member of the opposition party Al-Islah and holds a position on its Shura Council, which is a party position and not a parliamentary seat. Al-Islah is an umbrella party, which has expanded beyond it roots as an Islamic political party after it began to oppose President Saleh around 2005, but its core constituents are members of the Muslim Brotherhood and the Salafists. Karman has not aligned herself with either group and is a moderate in comparison. Her membership in Al-Islah is controversial because of Abdul Majeed al-Zindani's membership in the same party. Zindani was the head of the Yemeni Muslim Brotherhood and is currently the head of the Salafi wing of the party, which has taken more conservative stances on women and marriage. He is also listed on the United States Office of Foreign Assets Control's Specially Designated Nationals List, a list which the U.S. has used to prevent money from being transferred from charities or businesses to terrorist groups. Zindani has long been associated with Anwar al-Awlaki, who was killed by a U.S. Hellfire missile fired in a drone attack 30 September 2011. The United States linked Awlaki to terrorist attacks and Al-Qaeda. Yemeni journalist Nasir Arrabayee reported that the last three locations where sources said Awlaki had visited were either the home of a relative or the homes of Al-Islah members, including the home of Zindani. Karman, who claims independence from the party line, said, "I do not represent the Al-Islah party, and I am not tied to its positions. My position is determined by my beliefs, and I do not ask anyone's permission." Tawakkol Karman co-founded the human rights group Women Journalists Without Chains (WJWC) with seven other female journalists in 2005 in order to promote human rights, "particularly freedom of opinion and expression, and democratic rights." Although it was founded as "Female Reporters Without Borders," the present name was adopted in order to get a government license. Karman has said she has received "threats and temptations" and was the target of harassment from the Yemeni authorities by telephone and letter because of her refusal to accept the Ministry of Information rejection of WJWC's application to legally create a newspaper and a radio station. The group advocated freedom for SMS news services, which had been tightly controlled by the government despite not falling under the purview of the Press Law of 1990. After a governmental review of the text services, the only service that was not granted a license to continue was Bilakoyood, which belonged to WJWC and had operated for a year. In 2007, WJWC released a report that documented Yemeni abuses of press freedom since 2005. In 2009, she criticised the Ministry of Information for establishing trials that targeted journalists. 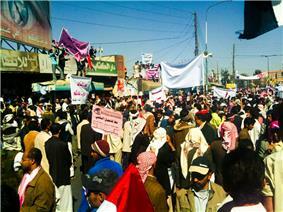 From 2007 to 2010, Karman regularly led demonstrations and sit-ins in Tahrir Square, Sana'a. Karman claims that her family originated from Anatolia and in a place known as Karaman, which is located in modern Turkey. The Turkish government offered her Turkish citizenship and she accepted her additional citizenship documents from the foreign minister 11 October 2012. Nobel Laureate Tawakkol Karman was born on 7 February 1979 in Mekhlaf, Ta'izz province, Yemen. She grew up near Taiz, which is the third largest city in Yemen and is described as a place of learning in a conservative country. She is the daughter of Abdel Salam Karman, a lawyer and politician, who once served and later resigned as Legal Affairs Minister in Ali Abdullah Saleh's government. She is the sister of Tariq Karman, who is a poet, and Safa Karman, who works as a journalist for Al-Jazeera. She is married to Mohammed al-Nahmi and is the mother of three children.